It’s summer time, and that means a lot of people are camping. Taking their families fishing, telling stories around the campfire and roasting marshmallows. For some people, camping means leaving your technology at home. But not me. I don’t know about you, but I’m not going to let a little thing like being in the middle of the woods stop me from checking my email, posting embarrassing pictures to Facebook and writing articles for PlugThingsIn.com. You don’t have to, at least if you don’t want to. And while it will depend on where you decide to go camping and to what extreme, there are plenty of ways to access the internet on your camping trip, should you choose to do so. Here are 6 different options for connecting to the internet while you’re out in the woods. 1. USB – One option is to buy a USB. These are little modem/routers that you plug into the side of your laptop to access 3G internet. The sticks cost anywhere from $10 to $50, depending on where you get them from and whether or not you sign up to a contract. The plans will run $30 to $50 per month, although you can buy prepaid sticks too. You will want to check the coverage of the ISP before signing up to make sure you’ll have a connection wherever you’re camping. 2. Use Your Cell Phone to Tether – Another option is to tether your connection using your cell phone. You’ll want to be careful of this option though, as many carriers will charge you extra for it on top of your mobile plan because you will use more data than if you were to just use your phone. You can also drain your battery quickly. 3. Mobile Modems – Mobile modems are also another option. These will set you back $50 to $250, and can be used to power multiple devices including tablets, laptops and your cell phone. Again, prices will vary depending if you get them with a carrier or if you buy them separately and just buy a data plan. You’ll also want to check coverage before picking one up. 4. 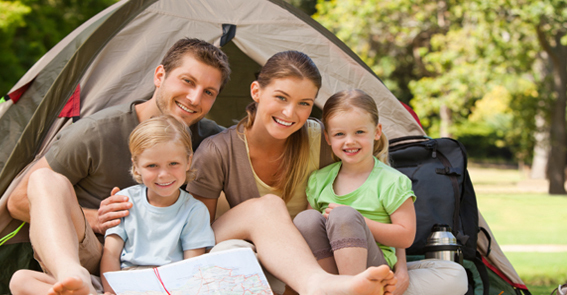 Wi-Fi From Campground – Many campgrounds are not equipped with wi-fi access. In fact, over 80% of KOAs have wireless internet access. Keep in mind that it may cost you $8-$15 per night, and it might be included with the cost of your nightly stay. 5. Wi-Fit Hotspots – Another option is to leave the campground and find a wi-fi hotspot somewhere. You can go to a restaurant, library or even a Starbucks. This clearly won’t be an option if you’re in the middle of the woods. However, 3G access might not be either. 6. Satellite – Satellite internet is the most extreme option. The reason why it’s so extreme is because it can cost you $1,500 at a minimum to get started, and even well into 5-figures. That doesn’t include the monthly fee of around $60 to get access. You’ll have to set it up too, which includes installing the satellite dish and getting it pointed in the right direction. There you have it — 6 options for getting internet while camping. Don’t forget that other than wi-fi (hotspots), you’ll want to double check the coverage maps before signing up. Nothing would be worse than to buy internet access, get out to the middle of the woods and then find that you’re out of range. So, what do you think? Have you used one of these methods for accessing the internet while camping? Have you tried something that I don’t have listed above? I’d like to hear about it.